Smoking chicken breasts can be a tricky proposition. Breast meat is extremely lean and will turn into some pretty tough stuff if you take it past its target temperature of 165F. This quick guide will walk you through how long to smoke chicken breasts under a couple of different scenarios. 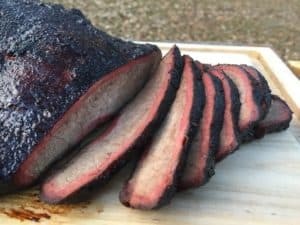 I wanted to give you some precise numbers for this guide so I fired up my pellet grill and ran it at two different temperatures, 275F and 325F. I also smoked two types of breasts, bone in breasts that weighed a little over a pound and boneless breasts that weighed a little under a pound. I took two chicken breasts, seasoned them with a generic poultry rub and then allowed it to rest at room temperature for 30 minutes while the smoker lined out at 275F. One of the breasts was a boneless, skinless breast that weighed about 0.7 pounds while the other was a bone in, skin on breast that weighed about 1.1 pounds. 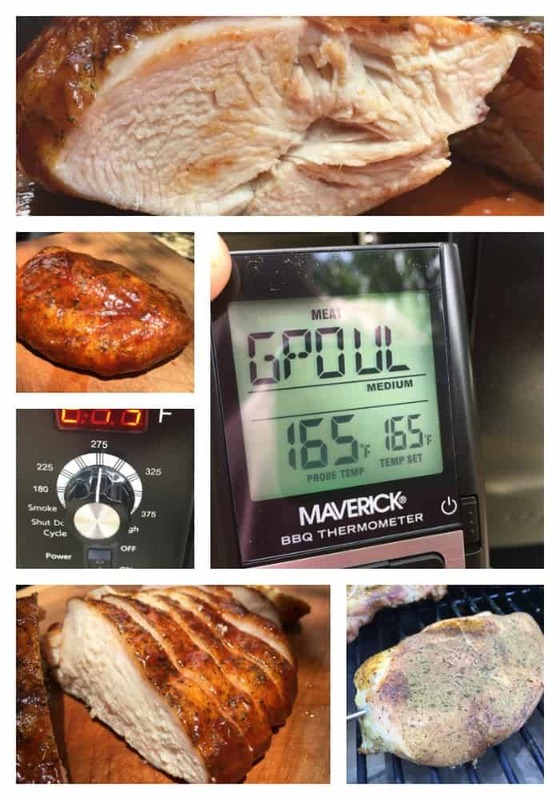 I inserted the thermometer from the Maverick digital temp probe into the smaller boneless chicken, put them on the pit and kept the lid closed until the bonelss chicken reached exactly 165F. 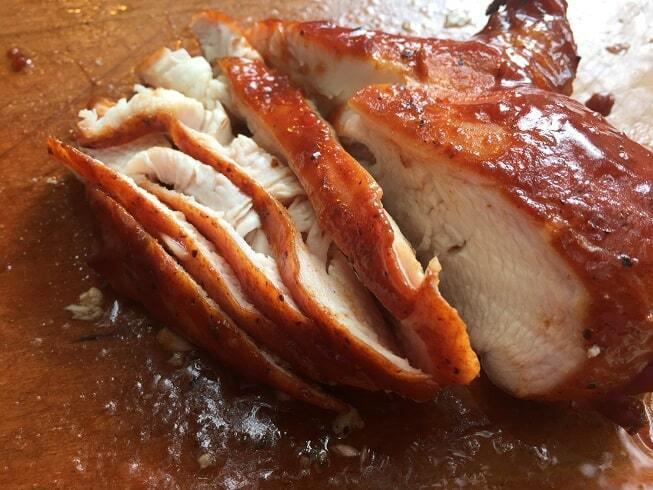 It took 65 minutes for the boneless breast (0.7 pounds) to reach 165F when smoked at 275F. I transferred the temperature probe over to the bone in breast when I took the boneless one off the smoker. While the smaller boneless breast was done after 65 minutes the larger breast was only at 156F. It took an extra 20 minutes for the bone in breast to reach 165F. It took 85 minutes for the bone in breast (1.1 pounds) to reach 165F when smoked at 275F. I repeated the experiment above but had the smoker set to 325F. It took 45 minutes for the boneless chicken breast (0.7 pounds) to reach 165F when smoked at 325F. It took 60 minutes for the bone in chicken breast (1.1 pounds) to reach 165F when smoked at 325F. Between all four pieces of chicken the absolute best was the boneless breast that had been smoked at 275F. The chicken pieces smoked at 325F were tougher than those smoked at 275F. I think the faster cooking made the muscle fibers “seize up” a little. Between the two breasts smoked at 275F I liked the boneless one better because it was able to take on a little more smoke. I also liked it because it was easier to slice and wasn’t covered in the rubbery skin that comes with smoking birds at low temperatures. The big take away is that the smoking time for chicken breasts will vary between 45 to 90 minutes depending upon the temperature of your smoker and the size of the chicken pieces. Always use a good digital thermometer to measure the internal temperature of the chicken and pull it from the smoker when it reaches an internal temperature of 165F. These results ought to be the same regardless of whether you are cooking on a pellet grill, electric smoker ar charcoal kettle. About 20 minutes depending upon the size.